Earlier in the year we shared details of how Overstrand has commemorated the Great War and Tim Bennett has been back in touch to tell us what else is happening up at the coast. 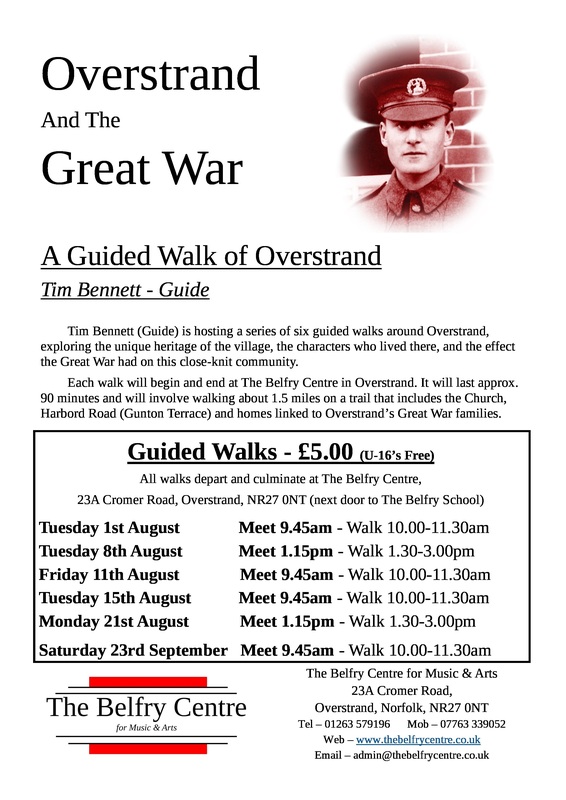 Over the summer Tim has been hosting guided walks around Overstrand which explore the unique heritage of the village, the characters who lived there, and the effect the Great War had on this small community. There is one walk left, on 23rd September which starts at 9.45. Tim says that the walk is about 1.5 miles long and takes about 90 minutes. Booking is needed and the guided walk costs £5 – call 01263 579196 or email admin@thebelfrycentre.co.uk to book your place. Tim’s walk is also available as self guided tour – pick up a leaflet at the Belfry Centre and start exploring! This entry was posted in Local collections, research project and tagged History walk, impact of war, Overstrand. Bookmark the permalink.